On-Site Cleaning - Alberta Canada computer cleaning, business opportunity Canada. Onsite computer cleaning offers computer cleaning service in Calgary Alberta and a business opportunity in the computer cleaning industry across North America. How Can I Get Started In My Own Computer Cleaning Business? Cleaning computer equipment isn’t hard to do – once you’ve had the training. You will learn the do’s and don’ts about what to do on a job. What you’ll realize is that at each workstation there is so much work to do. We even clean hand held calculators and cell phones. Who cleans this copier… The Tooth-fairy? We have also found that some people think their service contract covers the cleaning of their photocopiers. The reality is that these things are usually the dirtiest piece of equipment in the office. The reason? 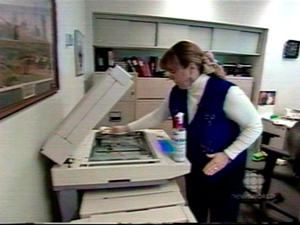 Almost everyone in the office uses the photocopier, unlike the computer systems, which are generally used by only one person. The service person usually comes out when the machine has a problem. When the service person arrives the most he or she usually cleans is the screen, or glass. The vents and buttons never get cleaned. Maybe that dirty thumb print on every copy came from the start button! We find that the employees of our clients are thrilled to see us come in. We can carry everything we need in a small folding cart – all the tools, brushes, supplies and products. You’ll be treated as a technician, not a janitor. Janitors get paid minimum wage; service technicians get $60.00+ per hour. Next: Tell Me More about this Computer Cleaning Business Opportunity!! Copyright © 2019 · Development & design by Catch This! Design Inc.